The Vengeance range of gaming peripherals has been a great success for manufacturer Corsair, and the update to its impressive wee gaming mouse, the Vengeance M65, is going to do nothing to change that. Corsair pretty much make everything that goes into putting together a gaming PC these days. In fact, I wouldn’t be the least surprised to see them badging up CPUs, motherboards and graphics cards in our Corsair-dominated future. But despite the broadening focus, now encompassing a huge range of components and peripherals, one thing has remained reassuringly constant - an emphasis on quality. So it was with the original Vengeance M60 mouse: a quality gaming rodent, with a 5700 max DPI capability and a rock-solid laser sensor backing it up. The difference between M60 and M65 is As you might expect from the iterative nomenclature, and the fact they’re using an identical chassis, there are no radical stylistic additions here. Under the hood, however, Corsair have upgraded the laser sensor, shifting from the Avago LaserStream ADNS-9500 to the ADNS-9800. That gives the M65 a maximum DPI setting of a relatively massive 8200. The M65 built quality is the best I've seen yet, far better compare to my Razor Copperhead. The upper body is made of durable plastic material, and the side is made with textured material for better grip. The lower body frame is made of light-weight aluminum. There are three weight pieces on the bottom of the mouse which you can customize with a flat head screwdriver. The braid cable comes to about 6.5 ft in length. 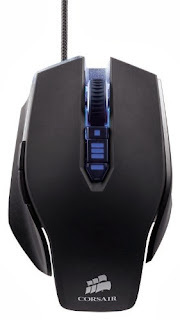 The M65 will fit your right hand pretty well out of box, this mouse is specifically designed for right-handed use. It felt better than my Razer Cooperhead and the R.A.T. The M65 did felt a bit heavy out of box, but after weights adjusted, it felt great! Glides on the bottom is nice and big, felt very smooth on both my table and the Goliathus mousepad. The customizable dpi allows you to toggle from gaming to getting some work done . And having the quick toggle sniper-mode (red button on the side) is awesome feature! The position of the sniper button needs to be push back a little. Design could have been a little better. Sniper button only works in certain games. This is an impressive update to an already impressive mouse.